This model is built on a scale of one inch per cubit. Its dimensions are 30 inches by ten inches by ten inches. My purpose in building this and the other articles here is that by studying the Scriptures in detail in order to build these objects I learn much more than I would by merely reading the words. Another advantage that has come from this project is that I am now seen as the "expert" on the Bible by those who showed no interest in what I had to say before this effort. This causes me to be asked at times to teach what I have learned. If you're a Star Wars fan you might recognize the characters I used for Moses and Arron. Obie Wan Kanobi (bad spelling), which is just the right size, was about the only one I could find that didn't have some odd costume that made it unusuable. 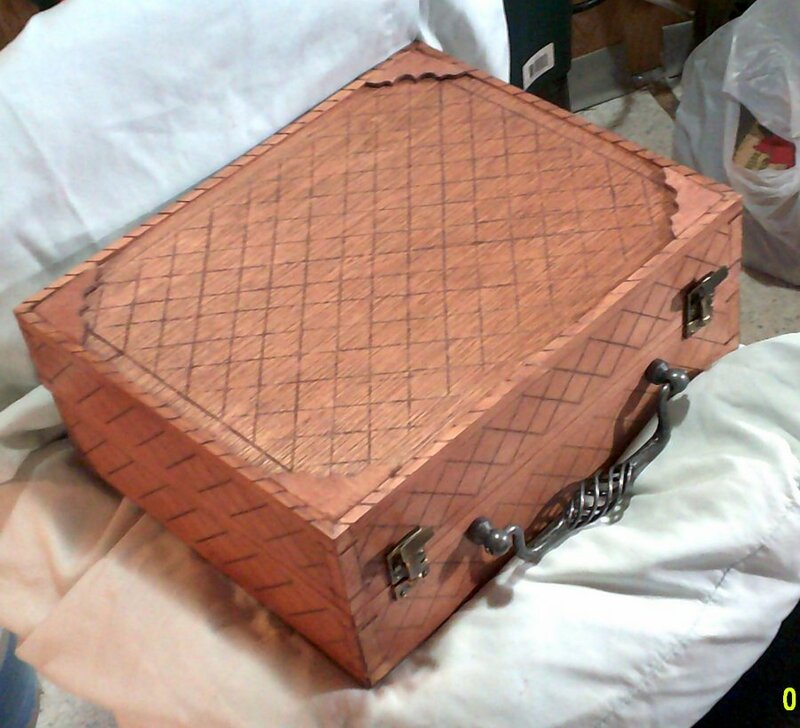 This Ark and its case was the first project I attempted. I was very fortunate to find the parts that I needed in this small town, and many of the parts were just the right amount, an inch or two less and I wouldn't have enough to make it. It seems to me that the wings as described when Cherubims are mentioned, they take a prime position in the picture presented. For this reason I gave strong emphasis to the wings. Also, the top of the Ark stands just a few inches above the knees on the average person. The one time a year that the Ark was approached, there was a lot happening at the time. It seems to me that plenty of room would be needed in this area, which I provided for. The Ark model is about 1/5 actual size. I studied all four Temples in depth, and found some interesting comparisons. The only one we have any real description of is Solomon's Temple, which lacks a great deal of in-depth detail in the Scriptures. 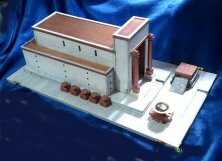 Much detail is given regarding Ezekiel's Temple, but it doesn't fit Solomon's but slightly. 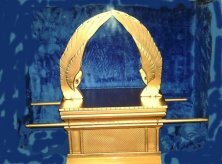 Zerubbable's Temple was an inferior attempt to recreate Solomon's, and Herod's Temple, the one we think of today, was built to the glory of a man, and has little to do with God. This model is on the small side, my not intending to build it in the first place. It was rather fun and informative however. It measures about half the size of the Tabernacle, but it fits well where I have it placed. The Temple only took a short time to build, since most of the complicated parts are hidden inside the building. If you're interested in building a model such as this one, you might be interested in some little tricks I used in the building of it. The straight pieces of wood used are different sizes of craft sticks, needing less cutting. The wheels of the laver bases are tiny washers glued to the balsa wood bases. The "sea" is a brass fitting I found in the brass tubing section of the local hardware store. The pillar bases are self-tightening nuts that fit tight on the wood dowels, and the tops of the pillars are pieces I found at a jewelry store. Lots of sewing on this costume. 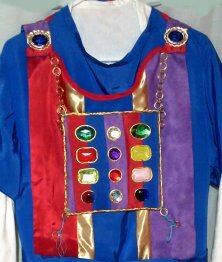 I had a hard time finding the "jewels" for the breastplate. As a base for the breastplate I used an embroidary sheet, a plastic piece with lots of little holes. For the border I wound several strands of gold rope together and stitched them to the base just described. For the shoulder pieces I used plastic rings bought from the local store, and the cases are bolo tie conches. I wanted to use "stones" of the same size for the breastplate, but I was lucky to be given these by a man who use to make costumes for plays. Some of the stones are painted in order to cause them to vary more in color than they would otherwise. Since no one knows what kind of stone many of them described are, it didn't matter what went where or how closely they are to those described in the Bible. Most of the instruments presented here are not playable,since that is not my purpose in making them. In fact, most of them are made with polyester cord rather than wire or nylon as strings. I will be adding photos to this section as I make more to add to the display. 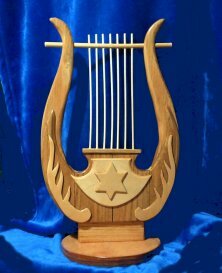 I've researched the musical instruments used during the time of the Bible, and not much is known for sure. But I made some simple copies of some in order to show what they might have been like. A fuller description of what I found is located in the story section of this web site. David's harp in the picture to the left, is not like what he would have used, nor is it a harp, but a lyre. However, it is the traditional image representing what he played. 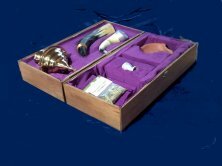 Some instruments such as the shofars I purchased, since I have no way to raise my own, however, I have considered carving such things. Most of the items here were not made by me, but I purchased them to use as an example of what the Bible is referring to. The lamp I made of some air-dry clay bought locally, and the alabaster vase is a tiny painted piece of wood carved into a vase. 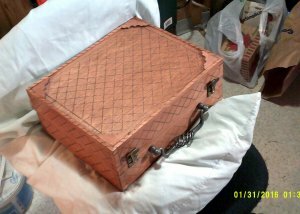 It seems as if I spend a lot more time making a case for the projects I attempt then I do in making the items to be housed in them. However, my living in a small place I don't have much space to store the items. Also, in order to carry the display, I need to have them enclosed so they can be carried and stacked. NOT BIBLICAL, but craft objects nonetheless. This box I made for a neighbor. 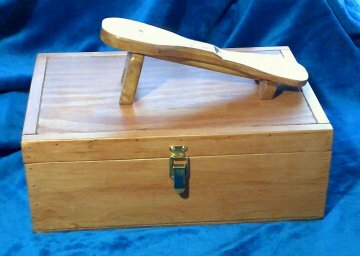 THIS SHOESHINE BOX I made for my doctor as a retirement gift. I enjoy experimenting with novel projects.